I made a trip to the Todaiji Temple (東大寺) in Nara last month. Nara was the capital of Japan 1,300 years ago. The main temple building is a massive wooden structure built toward the end of the 1600s (though much smaller and less ambitious than the original building long destroyed by fire). 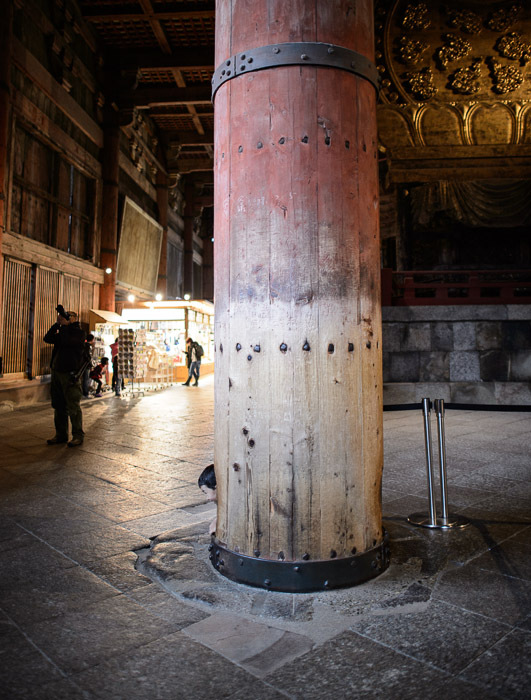 Until recently, it was the largest wooden structure in the world. Interesting to me was that the main columns were not individual tree trunks, but somehow crafted from component parts. The wooden boards comprising the exterior of each column can be seen in the photo above, but I have no idea what's inside... I'd love to know the full construction technique designed back then (1688) that gives the ~20m (65 foot) tall columns their rigidity. The building has survived (presumably many) strong earthquakes. I don't recall how many of these massive columns the building has (there must be dozens; you can see five of them in the background of the photo above), but this one particular column is special in a funny way. That's the subject of a separate post, here. The link to the ground isolation system. It’s just amazing! This is a wonderful image made even more interesting with the accompanying history about the subject.